Limited Edition Clear with Black Smoke Vinyl. Over a half-century later, the axiom remains true for hyper-kinetic hip-hop innovators, North Carolina’s L’Orange and Solemn Brigham—the hard-boiled duo behind the fun house fever dream, Marlowe. 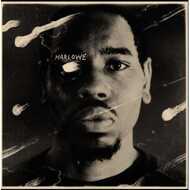 Released on Mello Music Group, Marlowe is a triumph of ambition, a rap bricolage blending prohibition and civil rights-era samples with Asian psychedelic rock flourishes. Solemn Brigham controls the microphone like a general who can’t help but be right. His flow is a blitzkrieg. It’s an Olympian sprint, gliding over snares and kick-drums like hurdles. He’s a showman seeking revolution—resolute in his desire to strike equilibrium between awareness and entertainment. Solemn applies the fictional protagonist’s search for the truth towards different ends. His crimes are existential yet specific, rooted in the injustices of the past and the attempt to redress them in the present. He’s an artist perennially seeking something to fight for, channeling energy from the music of the civic rights era, stealing timeless rhythms and inflection from classic funk and soul. An old soul with original ideas, tapping into the eternal reservoir of Sam Cooke to Ice Cube, Otis Redding to Chuck D, Curtis Mayfield to KRS-One. Over the course of 17 tracks, Solemn hurls sharp darts at counterfeits trying to crack his religion, the onslaught of time, and prevaricating rappers—all while paying homage to those who paved the road for him. He bounces off the beats like a trampoline placed in a speakeasy, doubling up on the vocals, burrowing into dense cryptic tangles of slang and then stretching them out with melodic ease. With dazzling cinematic mise en scene, L’Orange crafts a world that sounds like an old-time medicine show dropped into 90s Brooklyn, with Solemn summoning the holy spirit of Big L. Cymbals crash, drums pound, fuzzy guitars ride out, a bronze rain of horns cascade. This is gorgeous celestial dust, high-powered fuel with every syllable meticulously ordained. Marlowe cracked the case, but how they did it can only become clear under deeper investigation.